My first visit to Croatia was a curious mixture of the strange and the familiar. A country I had never been to, and a part of the world that still seemed foreign to me, yet also a place that I had often thought about for many years. 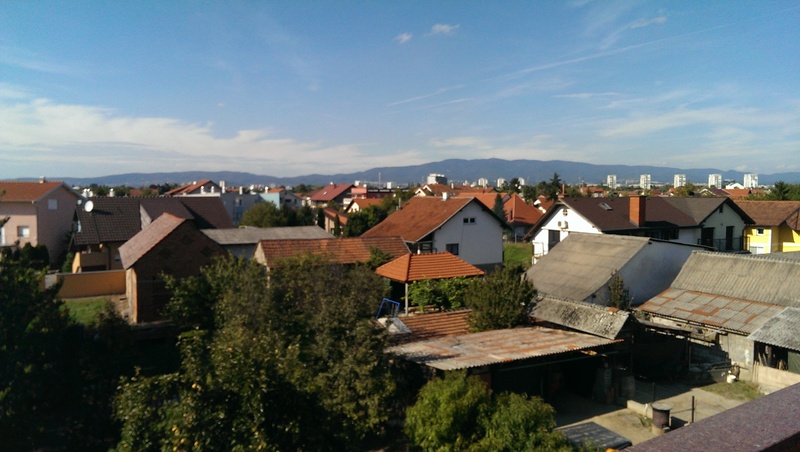 The feelings of familiarity stemmed from my surprise at how traditionally European much of the culture was, and also the fact that Croatia was the cite of my rendezvous with family and friends. But precisely because the context for these encounters was entirely new territory, the sense of familiarity was at times disorienting. The experience was akin to déjà vu: whether you chalk it up to a trick of the mind, echoes of a half-remembered dream, or genuine precognition, the passing sensation of surreality is there all the same. The time spent reconnecting with my friend David exemplified this tension. Anyone who’s ever caught up with an old friend after a long absence should be familiar with feeling simultaneously that no time has passed at all, and an acute awareness of how swiftly flow the days. David seemed essentially unchanged from our college days, but of course his life has changed significantly, mostly through the addition of important people. I relished both aspects of my reunion with David: meeting the person I remembered and spending time with my friend in much the same way we passed time together in college; and getting to meet his wife and daughter in their home, taking in the view of Zagreb and the surrounding mountains from their flat’s balcony, and meeting the roosters who live out back. On my last morning in Zagreb, I met Z outside the national theater. I had previously mentioned to her that I wanted to ride one of the city’s blue streetcars, and so she escorted me to a Tisak kiosk in the main square to buy a tram ticket. We rode the tram down Ulica street toward the plaza nearest the family’s apartments. 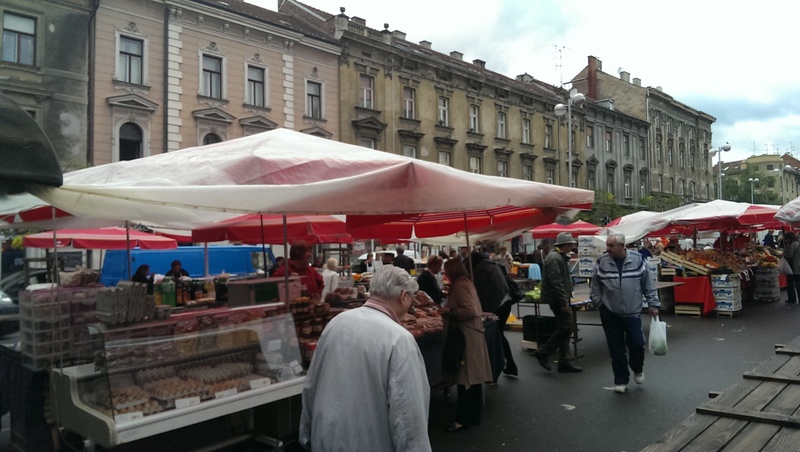 It was Saturday, and the city squares were filled with carts and stands bearing wares for the weekend open markets. 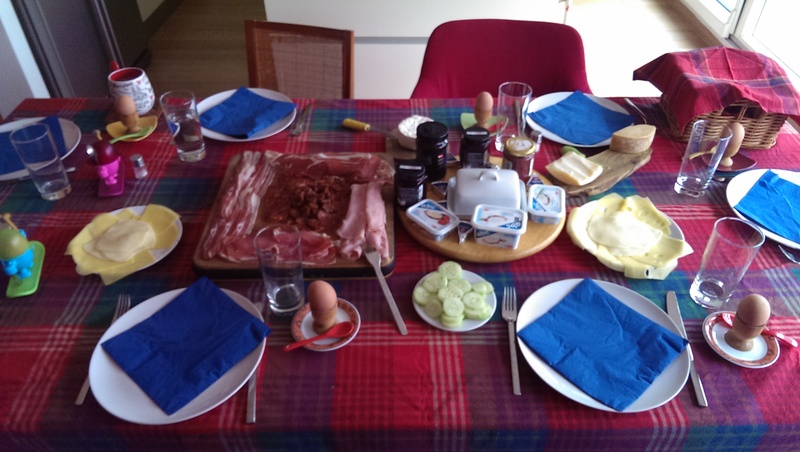 When we arrived at the apartment, there was a full brunch spread laid out on the table. Soon family members began to assemble: first Z’s sister, then her niece and nephew, and finally her parents. I then learned that this generous brunch was not arranged solely in honor of sending me off; it was also the grandfather’s birthday. So we gathered to eat, commemorate the end of my visit, and celebrate a patriarch’s birthday. Fortunately my misplaced package had since been recovered and delivered to Z’s apartment, so I was able to distribute the gifts sent by my mother-in-law. 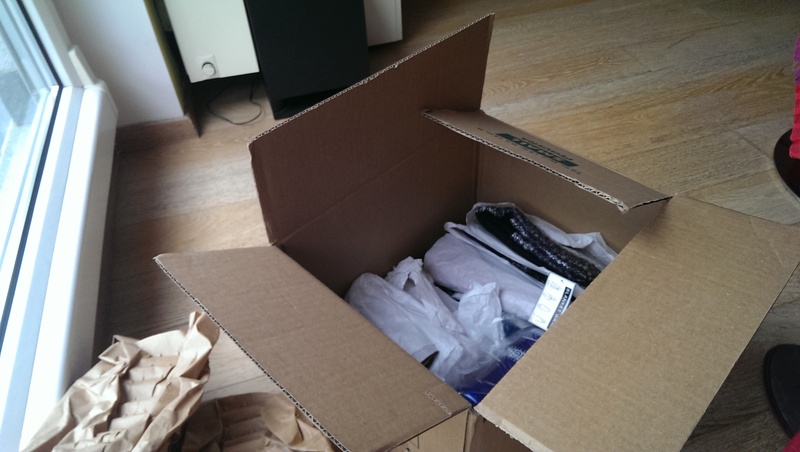 This was a great relief, as I didn’t know how I would’ve faced my mother-in-law had the gifts gone undelivered. We ate, we sang, we had cake and exchanged presents. I said my goodbyes to the family and Z drove me to the airport. I spent less than a week in Croatia, and only part of it with this adopted family. From the moment I passed Croatian customs control, Z and her family made me feel as warmly welcomed as possible. My sojourn in Croatia was one of the great trips of my life, thanks in no small part to their kindness and generosity. I’ve known Z less than a year, and spent perhaps a combined 72 hours in her presence; nonetheless, when we bade farewell at the Zagreb airport it was a touching and tearful goodbye.